I have been a note-taker since developing the habit in high school. For me, the process of taking notes is as much about getting engaged in the talk/conversation as it is for future reference. In the past few years I have tried to shift my note-taking habits from archaic pen and notebook to digital options. The iPad was a nice improvement….but still it lacked. Often my notes have a doodle or sketching element as I try to depict something visual. I annotate, draw arrows etc. I also find it annoying to type while involved in a discussion…it feels very “court-reporter.” Bottom line, it’s still just a heck of a lot easier to do these things with a pen and paper than a finger and glass screen. But I refuse to ditch technology and take a whole step backward to kinda go forward….follow? Now I don’t have to. I was recently in a meeting and a colleague pulled out a very sophisticated looking pen from his satchel. The topic of conversation in the meeting for the next ten minutes revolved around his slick contraption called a LiveScribe Echo 8MG Smartpen. I thought for a moment I heard a choir of angels singing from above…this thing is a great middle ground between old school analog note-taking and modern technology. The pen works with specifically designed note pads and records both what is being written in the pads AND the audio if desired! 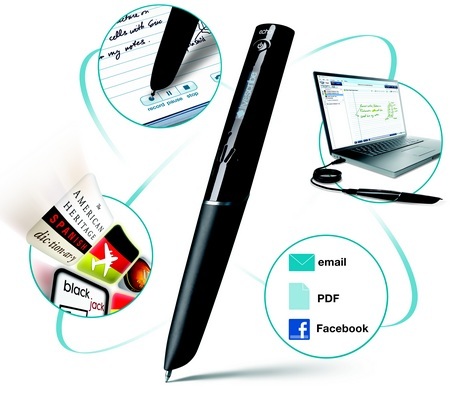 You simply connect the pen via USB port at the end of the day and your notes are uploaded to your computer. It gets better. LiveScribe syncs with any number of programs…Facebook, Google Docs and the holy grail of them all Evernote. What makes this even better than just capturing a picture of notes and storing it on my computer is the ability to add tags. Now, if I really want to find something I know was noted in my tablet, it’s far easier to find than scrolling page by page. Notes can be stored as .PDF files and audio even the audio recordings can be exported. You can even save/create a “Pencast”…which is a Flash movie of your writing overlaid with the audio recording. Genius. (Note: with a separate program called MyScript you can convert your clearly written notes into text.) It seems to me, these features are really valuable for consultants, attorneys and students to name a few. The note pads come in a variety of sizes to suit your needs, or you can print your own “dot” paper as long as your printer is capable of 600 dpi resolution or greater. The 8MG version of the pen ran me $180 on Amazon.com. I picked up a replacement pack of ink cartridges for less than $10. Thursday I am going to discuss a long-time favorite of mine: Evernote. The combination of the LiveScribe pen and Evernote is like the combination of peanut butter and chocolate in a Reese’s Peanut Butter cup.